Many people are self-conscious to smile because they have missing teeth. Still others struggle to chew because of missing teeth. Others have teeth shifting or breaking because of the extra pressure on them due to missing teeth. It does not matter what your reason is for wanting to replace missing teeth, there are several replacement methods available. SPOILER ALERT… Only one replacement method looks, functions and feels like an actual tooth. This is probably the greatest dental advance in my career. And this statement comes from a dental technology “geek”! Dentistry has lasers, modern pharmacology local anesthesia, digital x-rays, 3D x-rays and 3-D printers to just name a few. Yet, the ability to replace a tooth with a dental implant beats them all! Why? Because I can now place a dental implant in the jaw bone to replicate a tooth root. Once the bone fuses to the implant I can fully restore the implant to a complete tooth. A new tooth that is implanted in the jaw bone and one that comes out of the gum tissue. They look, function and feel completely natural because they are growing out of your jaw just like a REAL tooth. It’s the dental equivalent of an artificial knee or hip. 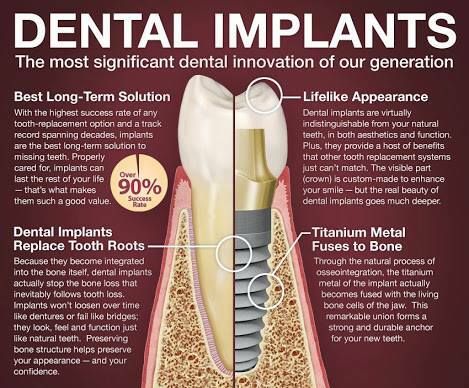 Dental implants can be used to replace one tooth or even all of your teeth. 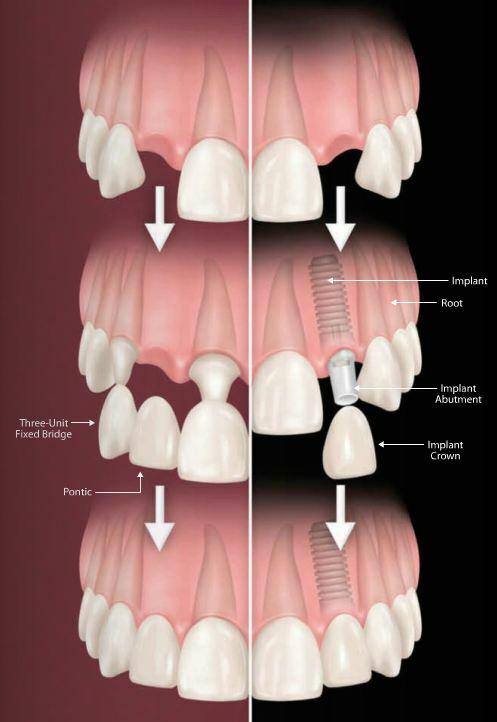 Furthermore, implants can be utilized as anchors to secure dentures. This replacement option used to be the “gold standard” in dentistry in the 1990s. It comes very close to looking and feeling like your own teeth. However, it also requires substantial destruction of the teeth involved. The teeth on either side of the missing tooth are irreversibly cut down for crowns, and a single piece that contains all three teeth is cemented on. So you have now taken your one missing tooth problem and turned it into a three tooth treatment. Unfortunately, two teeth that didn’t NEED crowns now have them. Furthermore, the average lifespan of a bridge is about 10 to 20 years. Thus, bridges are not the greatest long term solution. Lastly, lots of the teeth that are cut down will need root canals due the aggressive cutting down. This is the most inexpensive option, fastest and also the least comfortable tooth replacement option. 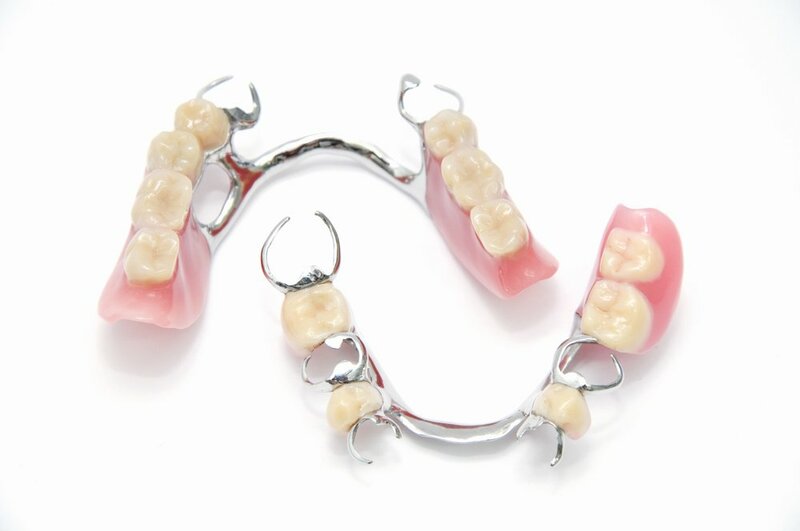 While the metal and plastic partial denture does replace missing teeth it in no way gives patients the chewing strength of a bridge or dental implant. I have seen many patients who opt for a partial due to the cost and hardly ever wear them. It’s the “wooden leg” version of tooth replacement. You aren’t going to go jogging with one. You aren’t going to lay on the beach in a bathing suit and have people think it’s a real leg. But it sure beats hopping around on one foot! 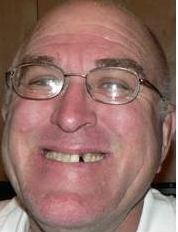 There are many options to replace missing teeth. It is important you pick the correct replacement that is best for you. 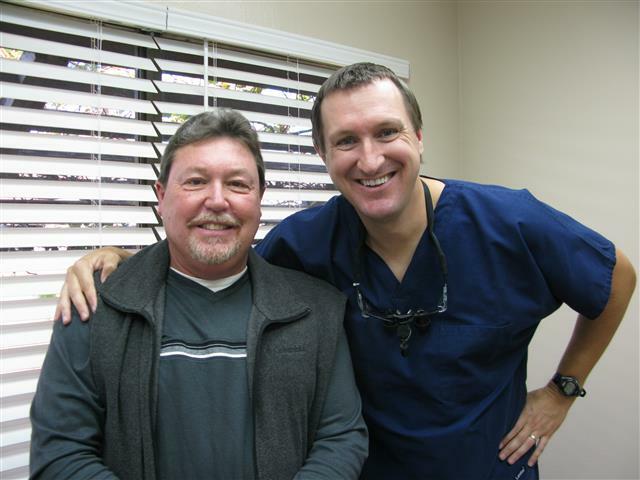 Come visit our office at 3421 Burke Rd STE A, Pasadena, Texas 77504 and see how Dr. Nugent is changing people’s lives. Call us at 713-941-8261.